Creativity requires consistent encouragement and measured inputs to blossom and create its own world. Irrespective of age, creativity inborn can be cultivated and refined with learning. 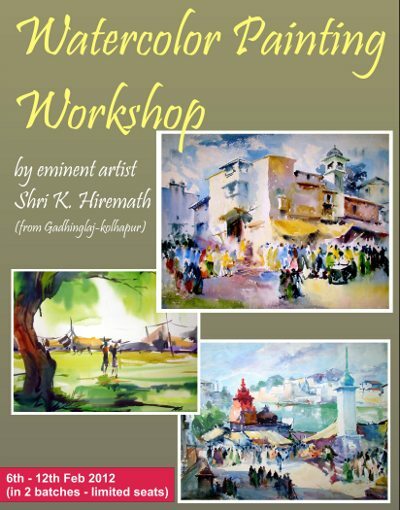 A Watercolor painting workshop, for everyone who has inclination towards art and painting. It is designed to give basic knowledge on painting and handling of the medium, in short experiencing the possibilities of watercolor medium. Eminent artist and seasoned art teacher Shri Kashinath Hiremath (from Gadhinglaj-Kolhapur), will share his knowledge and guide the enthusiasts. M 17, industrial estate, Udyambag, Belgaum.